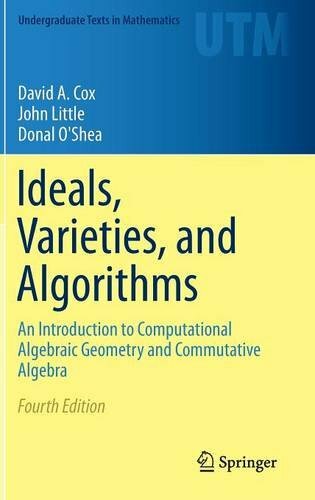 John Little, David A. Cox, Donal O'Shea, "Ideals, Varieties, and Algorithms: An Introduction to Computational Algebraic Geometry and Commutative Algebra, 4th Edition"
This text covers topics in algebraic geometry and commutative algebra with a strong perspective toward practical and computational aspects. The first four chapters form the core of the book. A comprehensive chart in the Preface illustrates a variety of ways to proceed with the material once these chapters are covered. In addition to the fundamentals of algebraic geometry—the elimination theorem, the extension theorem, the closure theorem and the Nullstellensatz—this new edition incorporates several substantial changes, all of which are listed in the Preface. The largest revision incorporates a new Chapter (ten), which presents some of the essentials of progress made over the last decades in computing Gröbner bases. The book also includes current computer algebra material in Appendix C and updated independent projects (Appendix D). 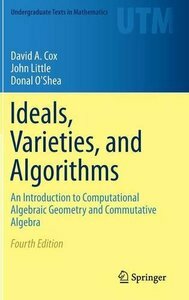 The book may serve as a first or second course in undergraduate abstract algebra and with some supplementation perhaps, for beginning graduate level courses in algebraic geometry or computational algebra. Prerequisites for the reader include linear algebra and a proof-oriented course. It is assumed that the reader has access to a computer algebra system. Appendix C describes features of Maple™, Mathematica® and Sage, as well as other systems that are most relevant to the text. Pseudocode is used in the text; Appendix B carefully describes the pseudocode used.